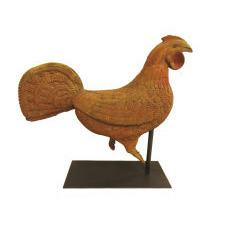 American Copper Gamecock Wethervane; American Hollow Body Copper Gamecock Weathervane with Zinc Feet mounted on bar. 16 3/4" High. 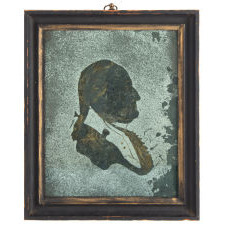 In as found gilt surface. Possiblily by Mott Iron Works, New York, NY. Dents. C. .. 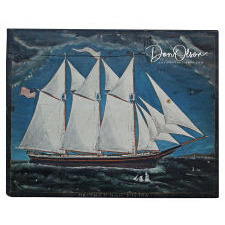 Folk Art American Tramp Art Cabinet; Folk Art American Tramp Art Cabinet,A Drawer marked Burlington, Vermont,One drawer signed MR.R, Early 20th century The charming & rare miniature cabinet with four drawers .. Oval Nantucket Basket; Nantucket Basket. Oval swing handle. One break of top weaver. Portrait by Micah Williams; Portrait of a Young Woman Attributed to Micah Williams The sitter of this portrait wears a fashionable tortoise shell comb amidst an elaborately curled hair style. 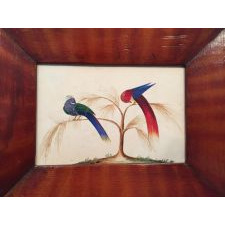 With her pr..
Painting of a Blue & Red Bird Perched on a Stump ; This charming and colorful watercolor on paper undoubtedly charmed the artist as it continues to charm the modern viewer. Original condition. Boot Maker's Trade Sign; This carved and gilded trade sign would have hung on the exterior of a store front, the form suggesting a boot maker’s shop to anyone passing by. 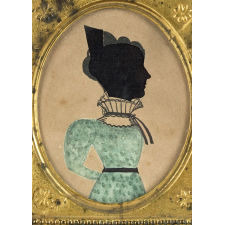 Dimensions: Date ..
A Pair of Profile Portraits; Subjects: Asa Ransome Swift (1791-1822) and Fawnia Cole Swift (1791-1880); accompanied by a portrait of Fawnia’s brother. Asa Swift was the son of General John Swift bor.. 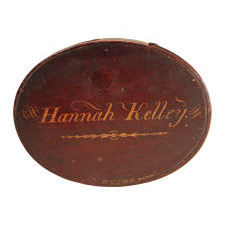 Signed Hingham, Massachusetts Gift Box; Hingham, MA, ca 1820-1830. In original red paint with original thin over-varnish with pine top and bottom and maple side wall with opposing fingers. Beautifully, professionall.. 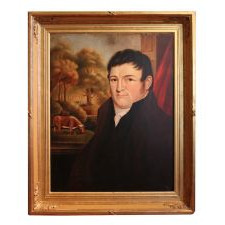 Scarce Blacksmith and Carriage Maker Painting; Probably Connecticut, ca. 1870-1880. Oil on canvas. The proud owners/workers standing before the Shea and McCarthy Blacksmithing and Jobbing Shop joined with the C.S. Gamwell .. FOLK ART GENIUS. A LITTLE MASTERPIECE. 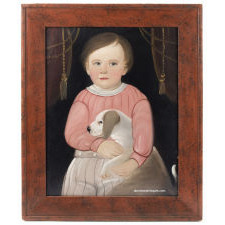 WILLIAM MATTHEW PRIOR; THE BOND BETWEEN J. ELY BROWN AND HIS DOG......Likely Boston area. Oil on board. SIGNED on the reverse: W.M. Prior Sept. 1849. Prior has masterfully told the story of the soft..
Rare Commemorative Ladle Depicting President Abraham Lincoln; American, ca. 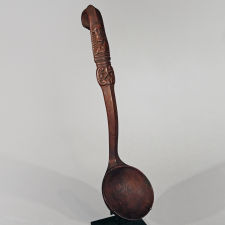 1865-1875.Probably birch, possibly maple.This well executed and carved ladle is complimented by its exceptional form.Great condition with wonderful patina. "Carved and Painted Shoe Window Display Advertising"; Wood, polychrome. Early 20th c.
Carved Eagle Whirligig; American, late 19th/early 20th c.Appears to be carved from a single piece of eastern pine.Steel paddles.Weathered surface. 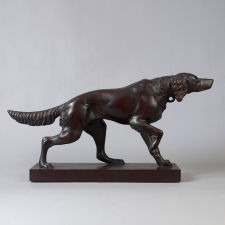 Carved Figure of a Setter Pointing; American, mid-late 19th century. Mahogany with crazed varnished surface.Condition: Excellent condition, minor scratches to the surface.The carved figure of a setter is made of..
Watercolor Valentine; A charming watercolor portrait of a young lady, done on a heart-shaped card, and no doubt given as a token of love; the card outlined with blue silk, and the portrait it.. 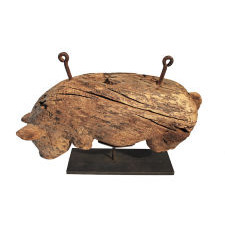 Early Carved Pig Meat-Market Sign of Exceptional Rarity; Northeast America, possibly Philadelphia, ca. 18th century. Hardwood (maple?) with remnants of early cream and black paint and retaining the original iron hangers. It attracte.. Paint Decorated Parcheesi Gameboard; American, ca. 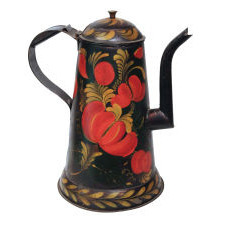 late 19th/ early 20th century. 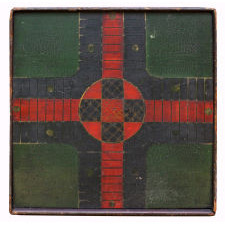 Having an especially quiet and soft color palette, this Parcheesi board is unique in its muted reds, olive green and cream, and cr..
Beautiful Pastoral Folk Art Townscape; View of Forestville, Chautauqua County, New York. 19th century. Oil on canvas with rich, saturated colors. The cozy picturesque village with closely knit structures wraps arou..
Rare Pair of Leather Fire Buckets; "Wing Russell, 1829"Sandwich, MassachusettsLeather, painted surfaceCondition: Virtually in untouched original condition, the original handles accompany the buckets.Provenance:..
Trade Sign: Mrs. L.M. 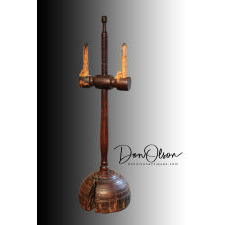 Crosswell, Millinery and Fancy Goods; New England, Maine, late 19th centuryPine and prepared surface, paint, gilt and silver highlights.Condition: Excellent condition, virtually in untouched condition, minor losse.. Puffy Sleeve Artist Silhouette with Brilliant Teal Dress; New England, ca. 1830-1835. Attributed to the celebrated "Puffy Sleeve Artist". 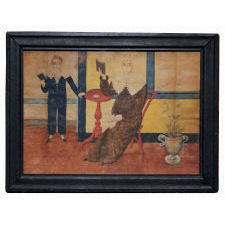 Hollow-cut, watercolor on paper over black-fabric backing of an elegant young woman with a room..
Sensational Folk Art Paint Decorated Violin Case; New England, ca. 1820-1830. Highly graphic and with first-rate surface. 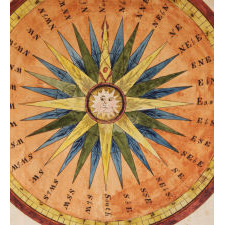 Comparable to fine, colorful, graphic trade signs of the period. 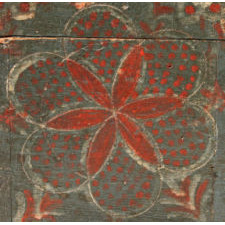 Original polychrome paint on pine. Sig..
Miniature Watercolor Portrait on Paper; Very well rendered portrait of a handsome gentleman housed in the original frame. 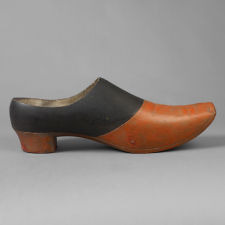 Similar to the work of Rufus Porter but believed to be done by a different, though unko..
Double-Sided Shoe and Bootmaker Sign; Northeast America, ca. 1870. 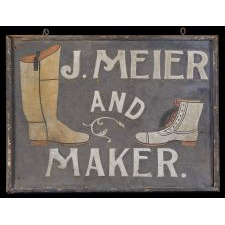 A highly visual professionally painted sign for the shoe maker "J. Meier" a survivor of a time when shoes were made by hand by craftsmen and adver.. 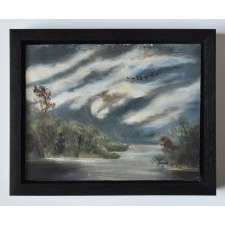 Brilliant Landscape Painting by THOMAS CHAMBERS; Hudson River, likely near West Point, ca. 1840-1850. Thomas Chambers (1808-1869) is well known for his highly imaginative paintings characterized by areas of bright, flat colo..
Uncle Sam Still Bank 'Composition,' circa 1940; American manufacture; this colorful hand-painted still bank depicting Uncle Sam is all original with no repairs and no repaint. Fabulous crazing throughout indicative of origi..
Toy Cast Iron Hubley Fire Engine, circa 1930; Beautiful all original condition cast iron fire engine, with original nickel plated removable figure, manufactured by Hubley in Lancaster Pennsylvania, circa 1930.There is no ..
Rare Steiff Turtle "Sit on" Pull Toy, circa 1950s; All original Steiff Turtle "sit on" and "pull toy," circa 1950s. Has original pull chord (17" plus) and original rubber wheels with red painted sides; original bar over the to.. Folk Art French Schoolhouse C.1880's; Folk art hand carved French schoolhouse which reenacts a typical classroom scene during that time period. 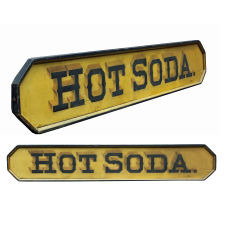 Circa 1880's. Maps, pictures, desks, a chalkboard and five doll like .. 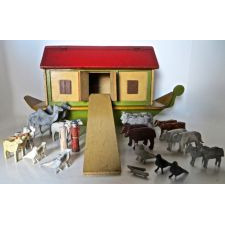 Early 20thC Noah's Arc (German); Toy Noah’s Arcs for children to play with were very popular in the late 19th century, and Germany was very prolific in their production. This particular arc is all origi..
19thC Horned "Eagle" Cane; Late 19th century bone hand carved cane in the shape of an eagle. American and dated "1873" Excellent original condition. 38" high. 19th Century American Empire Miniature Chest; Miniature furniture was used as “salesman samples” for the purpose of promoting the purchase of said article by showing exactly what the item would look like to pr..
"Red Streak Racing Car" Circa 1928; This toy was manufactured in 1928 by The Buffalo Toy & Tool Works Company located in Buffalo, New York. It was undoubtedly produced to cash in on the interest created by a.. Folk Art Cane with Dogs, Deer, Hearts and more; Folk Art cane fully carved with vines, dogs, deer, moon, hearts, tools, bottle and glass. a piece is missing from knob on top but it has been gone a long time. 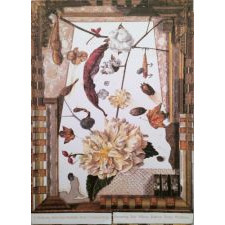 2 birds are mis..
Marquetry Picture of Blimp and NYC; A delightful inlaid picture using multiple woods. The scene shows a blimp in sky with an airplane flying upper right. NY Harbor and city skyline fills rest of image. 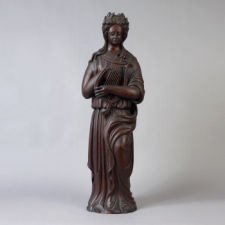 Faux wood..
19th C carved figurehead of a woman; 19th C carving of regal looking woman wearing a low cut dress. Her long neck and upward gaze add to the noble appearance. 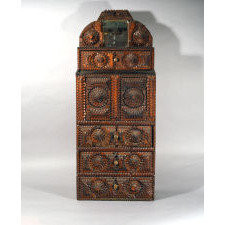 Well defined features and carved hairstyle enhance th..
Kelly Kinzle; Pair of Angel Blanket Chest StandsScandinavian, mid-19th century Pine, possibly other softwood, paintMid-19th centuryH: 14.25"; W: 7.5"; L: 25" An unusual pair of north.. Standing Greyhound J. W. Fiske, Circa 1872; ZincH: 36"; L: 46"; D: 13" This statue is based on an effigy of Eos, Prince Albert's favorite dog who accompanied him from Germany when he traveled to England to marry Queen V..
Fraktur/Watercolor /Bookplate ; Pennsylvania,19th century watercolor/ fraktur/book plate of two fancy birds- a peacock and a phoenix. 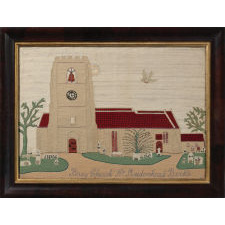 The details are exquisite and the condition is excellent. The bird on the..
Miniture Red Ware Bowl; Pennsylvania miniture Redware Bowl. Dark glaze. Rolled rim. Approximately 1" high. Probably Southeast Pennsylvania. C. 1865. 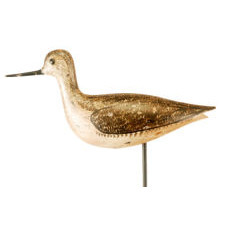 Tinny Redbacked Sandpiper Shorebird Decoy; Strong example in nearly mint original condition with one dime sized flake on left rear side from a shot that did not penetrate. Original stick. Not patented by Strater.. 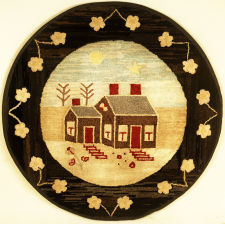 Round Hooked Rug With House and Flowers; Fine original condition. 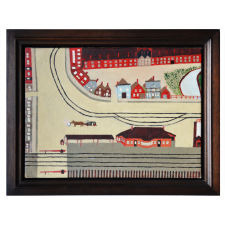 Professionally stretched and mounted for hanging. Red Poppies in Graphic Field Hooked Rug; Wool in excellent original condition. A dramatic visual composition with three red poppies centering abstract hash marks with four additional poppies in the corners, all enclo.. 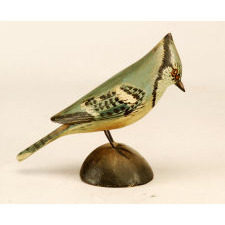 Oversized Carved Miniature Blue Jay; Early large carving with Crowell's round ink stamp and pencil species name. Nearly mint original condition with a soft patina. 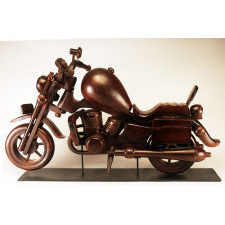 Large Carved and Painted Motorcycle; Articulated mahogany carving with rotating and turning (front) wheels in excellent original condition. Some professional glued repairs. 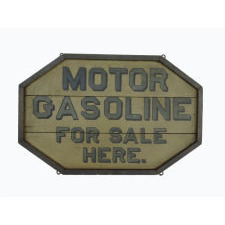 Includes custom wrought iron display mo.. 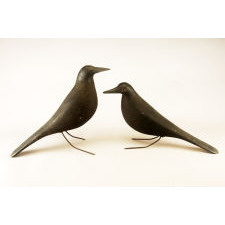 Matching Crow Decoy Pair; Stylish rigmate pair with turned facing heads in excellent original paint. 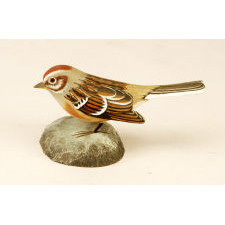 Both have professional bill chip repairs, the left facing one also has a small tail chip repair, and..
Carved Miniature Tree Sparrow; Unusual species in mint original condition. Mongrammed on base with #39. There are two matching Blackstone sparrows (Vesper and Fox) offered on our website: www.RJGAnti..
Art Deco Style Indian Tin Weathervane; Tin plated sheet iron and wire in untouched original condition. 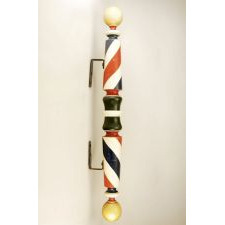 Boldly Turned Patriotic Barber Pole; Undisturbed original condition in its original red, white, blue and gold paint. As clean an example as you will find! Black and White 2-Sided Incised and Painted Parcheesi Gameboard; Poplar with splined breadboard ends. Exceptionally well-executed in dry original paint. 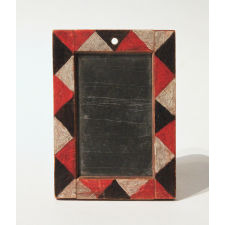 Appears to be a slate gameboard, but it is wood. Small superficial chip in one corner. 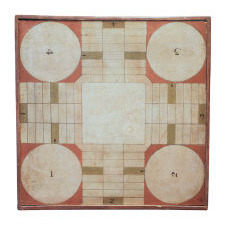 Mustard Decorated 2-Sided Backgammon Gameboard; A clean, dry, untouched 3-color gameboard with applied molding and square nail construction. Good checkerboard on back. This backgammon board was never hinged as most are; it .. 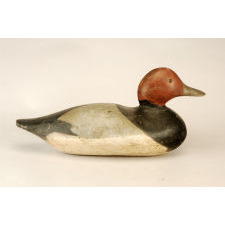 Early Redhead Drake Decoy; Retains its smooth (not spiral cut) neck dowel, suggesting it might be a collaborative effort between Mason and Dodge. Strong original paint. Neck filler has been replaced. 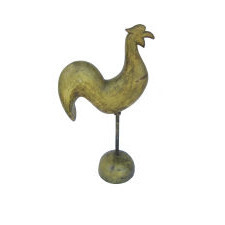 St..
Rooster Weathervane; Rochester, New Hampshire, Rochester Iron Works (1850-1915) Ca. 1875-1885 Cast iron Retains early 19th century yellow painted weathered surface This was a typical form that the..
Scribed Checkerboard; Scribed checkerboard with mouleded edges. 18'th c, prob American. 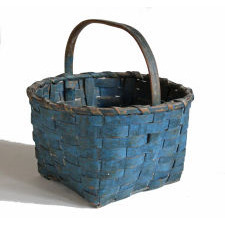 Oversized Slatted Basket; Handsome, oversized flat-bottom basket of slatted wood, metal and wire construction; American, late 19th century. Excellent patina. 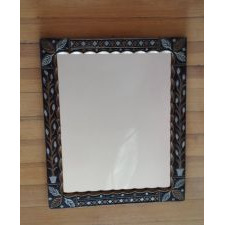 Very sturdy and in excellent condition.&nbs..
Carved Frame with Original Mirror, Chicago, circa 1905; Large, folky carved frame in original finish, with terrific pediment top, whimsey carved finials and scalloped edge against original mirror. Highly decorated with applied, car.. The Sketchbooks of John Samuel Blunt; The Sketchbooks of John Samuel Blunt by Deborah M. Child. Softcover. 120pp. Excellent condition. 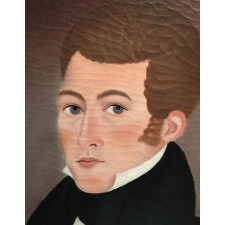 Blunt was a talented artist who worked in the seacoast of New Hampshire in the..
American Folk Paintings: Selections From the Collection of Mr. and Mrs. William E. Wiltshire III; American Folk Paintings: Selections From the Collection of Mr. and Mrs. William E. Wiltshire III. An exhibition on display at The VirginiaMuseum, November 29, 1977 to January .. 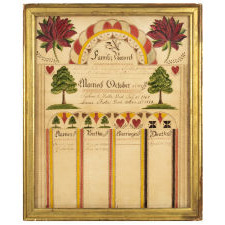 Folk Hearts: A Celebration of the Heart Motif in American Folk Art; Folk Hearts: A Celebration of the Heart Motif in American Folk Art by Cynthia V. A. Schaffner and Susan Klein. Small hardcover with dust jacket. In very Fine condition. 108pp ..
Alabama Artists by NALL; Alabama Artists by NALL. This is a SCARCE, fold open limited edition of loose prints produced by NALL of the 13 artists who were featured in his exhibition of ALabama art. 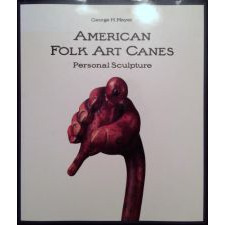 Thi..
American Folk Art Canes: Personal Sculpture; American Folk Art Canes: Personal Sculpture by George H. Meyer. 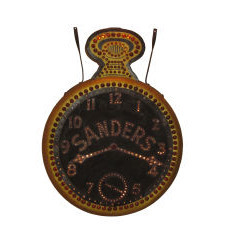 Published by Sandringham Press in association with the Museum of American Folk Art and the University of Washin.. Pair of Eiders with Babies; By Carl Malmstrom (1882-1975) of Long Cove, Maine This Eider family is mounted on driftwood. They retain their original paint and are signed on the bottom. Condition: Excelle..
Crowell Miniature Ruddy Duck; By Elmer Crowell (1862-1952) East Harwich, Mass. This Ruddy Duck retains its original paint. 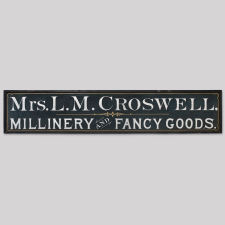 It has the Crowell impressed Rectangular brand on the bottom. Crowell has been ha..
Yaqui Ceremonial Mask; “Pascolas are the old men of the dance, and they perform at all manner of Yaqui feasts. Pascolas are individualists who perform as a result of dreamed visions. 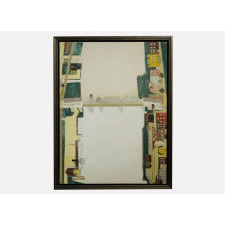 Their kno..
Sandpaper Drawing ; A fine Sandpaper Drawing depicting a town along side a canal or river inlet. 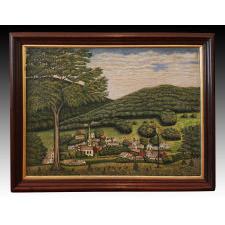 Painting of Cold Springs, NY; A watercolor painting of Cold Springs, NY. 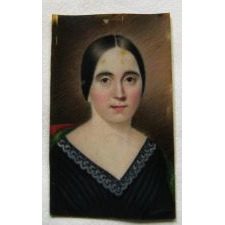 There is a banner at the top of the painting "The Hudson Queen passes Cold Springs Oct 14th 1839" The painting is in an old pe..
Mourning Picture; A watercolor mourning picture dedicated to dear Aunt Ellen ( Mrs. Bartow). It is in good condition with some small tears at the bottom and one at the top. 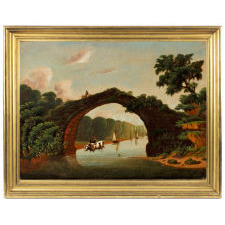 Hudson River Painting; A 19th C folk painting of an estate along the Hudson River. There are some early repairs and some minor flaking. The painting depicts a large landscaped garden area along with..
Folky Nautical Painting; A folk painting of sailors fighting over a disputed card game. 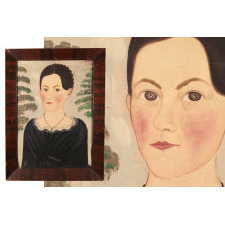 The painting is in very good overall condition with one small repaired tear. 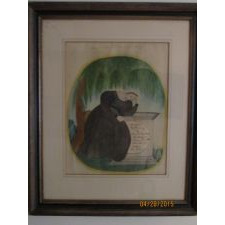 It is from the estate of a NYC coll..
Eagle Caligraphy; Early 19th C calligraphy drawing. Some staining in lower right hand corner. From the estate of a NYC collector. 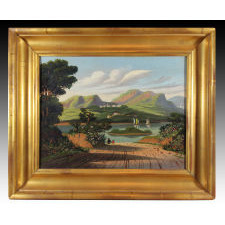 Dragonwick Castle; large o/c painting of an estate identified by an old paper label affixed to the back of the painting as Dragonwick Castle home of the Van Ryn family of Rhinebeck, NY. Painting.. 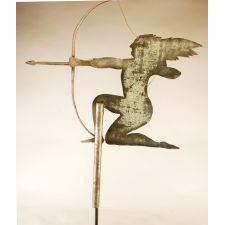 Shooting target; Painted sheet iron mechanical shooting target, lady and gent. blacksmithing. Good color and detail. 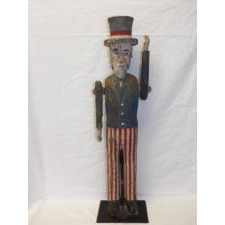 Uncle Sam whirligig; Rare full bodied figure of uncle sam, carved wood, polychrome red, white and blue paint with black shoes. Exceptional untouched surface and condition, appears to be the origin.. 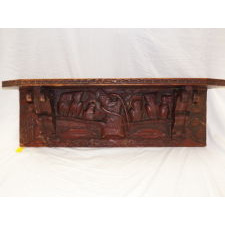 Shelf; Folk art relief carved wall shelf, carved owls perched on branch. Red paint on yellow pine. 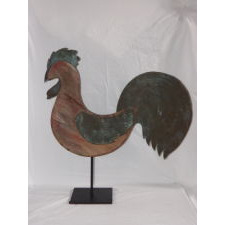 Rooster Weathervane; Folk art rooster weathervane, rare wood and coppper accents, great surface remnants of red paint. Pipe Trade Sign; Large size full bodied pipe trade sign, painted. Made for CPE company. 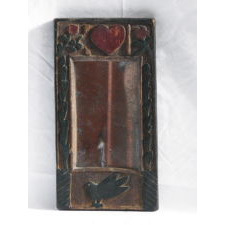 Mirror; Exceptional carved wood folk art hand mirror painted bird and heart. 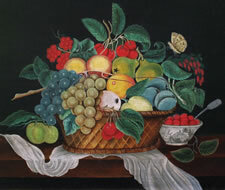 Still Life Painting; Expressing an unusual color palette, this still life watercolor on paper depicts fruit and vegetables with a glass pitcher with the initial, "W". 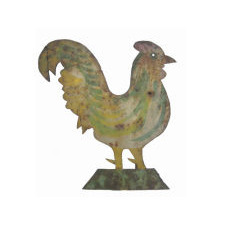 The painting remains in its o..
Howard Rooster Weathervane; Cast zinc and molded copper with a weathered patina. 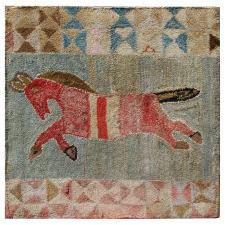 Provenance: "American Folk Art from the Collection of Kendra and Allan Daniel", Christie's, January 2001. 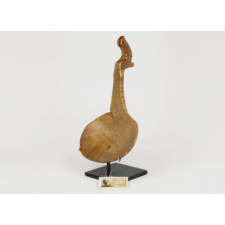 A Rare Oversized Slat Canada Goose Decoy; Geese and Brant were highly sought waterfowl by sport hunters on Cape Cod in the late 19th and early 20th centuries. There were several elite clubs on the Cape that catered to..
Arts and Crafts Style Doll House Furniture; Four pieces of handmade Arts and Crafts style doll house furniture in their original blue paint. All pieces are in very good condition, with some light wear that's expec..
Navajo/Zuni vintage bracelet ; Along with ingot or coin silver, this vintage Navajo bracelet is made with high-quality turquoise from various mines. Each stone is substantial in size and the bracelet r..
Paint-decordated Storage Box; A round paint-decorated storage box decorated on its lid with two parrots. Its ground color is black, and the decoative elelments are of orange and green. In..
J. Parks Portrait; A charming portrait of a young woman pictured with a vase of flowers beside her on a table, seated in a paint decorated chair, and holdiing a beaded purse with floral decorati..
Family Record; A family record for Jonathan Chase and Patience Peasley, drawn by Moses Connor circa 1818, probably near their home in Henniker, Merrimack County, New Hampshire.The arti..
on the corner sign; A sign probably used as a directional sign pointing the way towards a specific location. "On The Corner" . The sign is in very good overall condition. Heron Wood Carving; A Folky Wood Carving of a Heron. It has extensive wear to the painted surface due to having been used outside for many years as a confidence decoy. 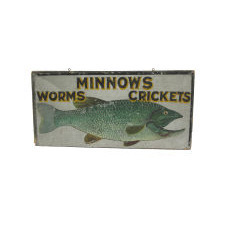 Fishmonger sign; A large carved fish trade sign used by a fishmonger. Found in Rochester, NY. Originally free standing it was attached to the board at a later date for hanging purposes. Some m..
Blackhawk Weathervane; A Trotting horse weathervane "Blackhawk" retaining it's original verdigris surface. The weathervane is in good overall condition. 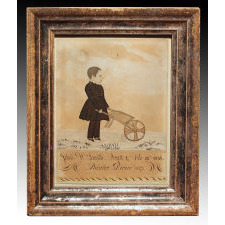 It is missing its mounting rod and has a few ..
Watercolor Memorial; Watercolor on paper with a paper label of Xenophon Shaw, frame maker from Salem, Massachusetts within the original frame. Navajo concho belt; With elaborate stamping, repousse',and chiseling, this Navajo concho belt has five conchas (2 13/16" d x 2 1/2" h), 6 "butterflies (2 5/8" w x 1 1/2" h) , and a large buckle (..
Figural Burmese Ox Cart Ornament; Wood carved polychrome dancing figure with excellent patina and typical wear for the age and usage. 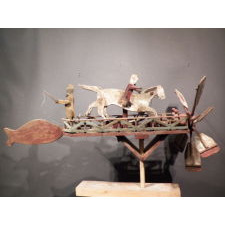 Sculptures were attached between oxen as a protective, identifying em..
Whirligig; Folk art painted wood whirligig, two men on horseback and man behind catching a large fish. horses gallop when the fins spin. untouched original condition. Indian Sign; Carved wood sign or stern board, folky Native American profile titled Viroqua in banner original polychrome paint, interesting releif recessed design. 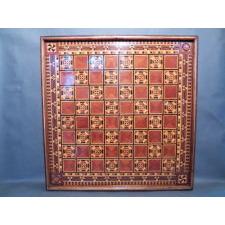 Game Board; Exceptional graphic inlaid gameboard, walnut, with various mixed woods in dovetailed case. 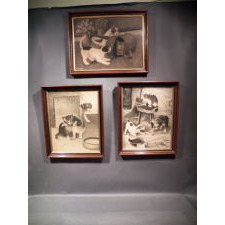 Folky Charcoal Drawings; Group of 3 folkly charcoal drawing, whimsical scenes of cats and dogs playing together. Charming and life-like expressions. 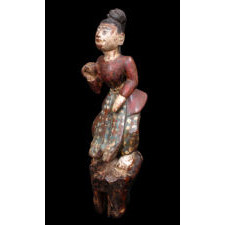 Dancing Man; Exceptional folk art gent dancing toy, carved and painted wood origin, Hatfield PA. !9th century. Zuni pictorial jar ; This Zuni pottery jar with tadpole, frog and dragonfly images continues the tradition of pottery at Zuni in the 19th century. With a strong attribution to Catalina Zunie becau..
Yavapai basket; The Yavapai and the Western Apache Indians are related and their baskets are similar to each other. Very symmetrical designs are generally considered Yavapai. The weaving mate..
Yavapai Apache figural tray; Three-rod coiled basketry tray with human figures woven out of willow and devil's claw. There are 14 stitches per inch and 6 1/2 coils per inch. Condition is excellent. ..
Vintage Zuni mosaic inlay pin/brooch; Zuni "rainbow god" pin, circa 1930s, made out of spiny oyster, mother of pearl, onyx, Blue Gem turquoise. This brooch was clearly made by a master lapidary who was able to cut..
Penobscot club; The Penobscot Indians of Maine carved clubs out of the birch root ball and trunk. 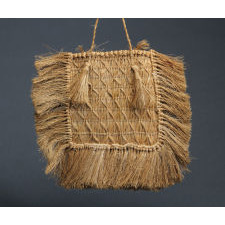 With chip carving and elaborate development of wolf faces, this is one of the best ..
Kawaiisu bottleneck basket; This well-woven coiled basket was made by the Kawaiisu Indians, who live in the California Tehachapi Valley and mountains, which straddles the ridge of the Sierra Mountai..
Acoma Historic jar, circa 1890 ; This early Acoma jar is strikingly beautiful. It addition, it is very well made and it has an intricate and very strong geometric design, reminiscent of pots made earlier.. Pair of Vintage Taxco Earrings ; Maestro Antonio Pineda was a leading member of the Arts Renaissance that occured in Taxco, Mexico after the Mexican Revolution. His work exemplifies great Modernist design as .. Diminutive Dome Top Paint Decorated Box by the COMPASS ARTIST; Lancaster County, PA, ca. 1800-1840. OF JUST THREE DOZEN DOME TOP BOXES ATTRIBUTED TO THE COMPASS ARTIST, THIS BOX IS THE SMALLEST AT UNDER FOUR INCHES. 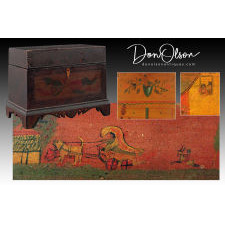 Poplar and perhaps pin..
LARGE SIZE CIRCA 1830 NEW ENGLAND SEWING BOX WITH GREAT ORIGINAL PAINTED SURFACE AND INTERIOR; Not only does this sewing box retain its original painted outer surface but it has all of its original interior painted surface. 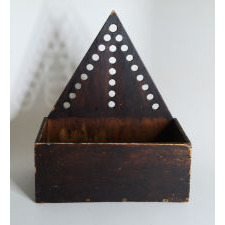 Note how ingenious the interior is set u..
Tramp Art Wooden Still Bank Box. 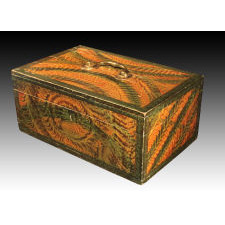 Dated 1915.; Intricately carved with elaborate open fretwork, this wooden box is dated "1915" with a carved inscription of " Stephanie Stevens", and is typical of tramp art objects made in.. 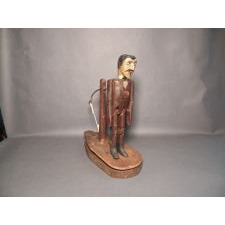 Mechanical Bank "Tammany" Circa 1873; Although "Tammany Bank" was patented and initially produced in 1873, it had quite a long run and was manufactured for many years after that, undergoing several variations; ini.. 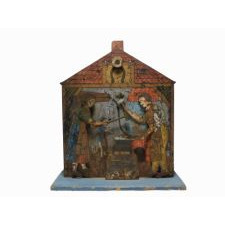 Folk Art Mechanical Bank, "Girl in Front of House," circa 1880; Hand-carved and hand-painted, this charming 19th century British Folk Art mechanical bank has all of the elements that constitute fine, self taught, and creative artistic skil..
"William Tell" Mechanical Bank. Circa 1896; "William Tell" mechanical bank was patented and manufactured in 1896 by the J. & E. Steven's Company in Cromwell, Connecticut. The bank is in excellent all original paint .. Spectacular Willet Shorebird Decoy Trio; Long Island, NY, Ca. 1900 Gunning rigmates in three attitudes. Well-carved with raised heart shaped wings. Strong original paint. Some neck filler is missing. Two have .. 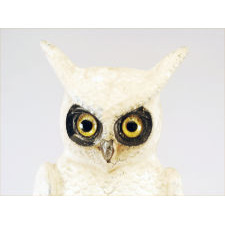 Snowy Owl Decoy; Swisher & Soule, Decatur, IL, Ca. 1930's Painted cast aluminum 2-sided fence post owl decoy in strong original paint. Minor flaking and in-use wear. 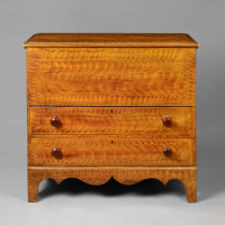 Only the second exampl..
Fine Painted Blanket Chest; New England, possibly VermontCa. 1820-1830.Eastern white pine with polychrome painted surfaceCondition: Excellent condition, original paint decorated surface with applied varn.. The Decorative Arts and Crafts of Nantucket; This blue cloth-bound book has gold spine titles and a matching blue cloth slipcase with ivory paper label. 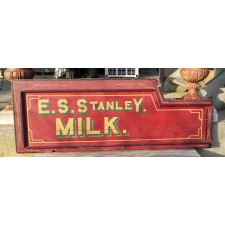 This edition is limited to 650 copies, which have been specially bo..
E. S. Stanley Milk Sign; E. S. Stanley New Hampshire 19thC side panel from antique milk wagon. Vivid red paint with white and yellow lettering and decoration. Large milk pails were placed in wago..
Carved Folk Art Frame; Exceptional carved and painted Folk Art frame with leaf motif in corners. Upright sides with flower pots containing trees or vines with leaves. Scalloped interior edge of fram..
Rooster Sheet Weathervane; Late 19th century unusual graphic and detailed sheet iron silhouette rooster weathervane with a pieced tail, iron strapping on the reverse, in original painted and decorated s..
Motor Gasoline For Sale Here Sign; Exceptional early 1900 rare genre double sided wood sign ‘Motor Gasoline For Sale Here’ in unusual octagonal shape with the sign having professional yellow letteri..
Heinz Ketchup Bottle; Late 19th century, dated 1891, glass Heinz ketchup bottle with removable zinc screw top, remnants of the original paper label intact, excellent condition. 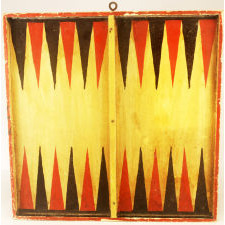 Yokuts gambling tray; The Yokuts are known as master weavers. Their baskets are among the most prized of all baskets. Yokuts women gambled using dice made out of walnut. Score was kept using.. 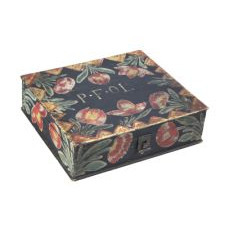 Paint Decorated Box from the Katcher Collection; Pennsylvania, ca. 1800-1810. White pine, with original tinplated sheet-iron hasp and hinges. Joined by unheaded cut nails and hide glue. 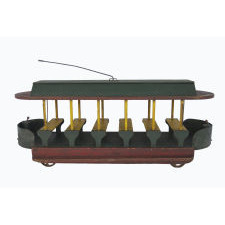 Known as a "Bucher" box based on an ex..
Arcade International Cast Iron Truck Circa 1920's; This truck was manufactured by the most prolific maker of cast iron toys during the 1920's, The Arcade Manufacturing Company in Freeport, near Chicago. 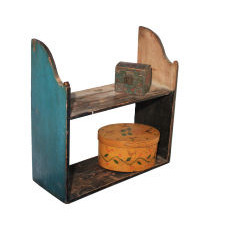 Cast iron black and blu..
"Old Woman In The Shoe" Pull Toy Manufactured by Ive's. Circa 1890; Rare American pull toy made in 1890 by the Ive's Corporation entitled "Old Woman in The Shoe", based on the English nursery rhyme whose genesis dates back to 1794. The shoe an.. Mechanical Bank "Monkey & Coconut" Circa 1886; Manufactured in 1886 by the J. & E. Steven's Company in Cromwell, Connecticut, this cast iron mechanical bank measures 5" long x 8 1/2" high. The bank is in excellent all .. Mechanical Bank "Paddy and the Pig," circa 1886; Although this bank was patented in 1882, it probably was not produced until 1886 when it first appeared in an advertisement. It was advertised as the "Shamrock" bank and was m..
Eastern Great Lakes Beaver Effigy Ladle; Ladle of fine line quality - note the graceful sweep up the animal's body and then down its back. Open carving between arms and head. Provenance: Andy Warhol Collection, Sothe..
Carved Figure of "Erato"; American, ca. 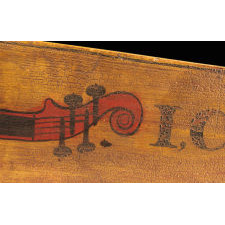 1850.MahoganyCondition: Missing small portion of the lyre. 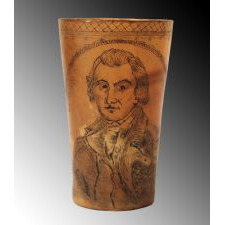 Retains the original varnish finish.This carved full length figure of Erato holding a lyre is finely e..
Rare and Important Patriotic Horn Beaker.....BATTLE OF BUNKER HILL HERO GENERAL JOSEPH WARREN; Ca. 1775-1810. Horn. Carving of General Joseph Warren, one of America's greatest heroes who was killed at the Battle of Bunker Hill on June 17, 1775. Reverse carving depicts t.. 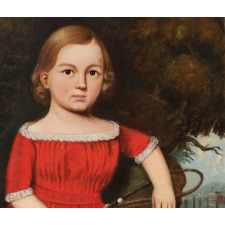 Brilliant Full Length Portrait of Young Boy in Red; Oil on canvas. 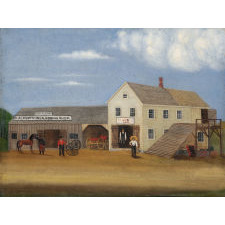 Signed lower right "Wm Lydston Jr" "Pinxt" (painted by) "Boston 1847". This bold portrait is beautifully executed of an unusually handsome young boy with big ex..
Janus Palm Wine Kuba Cup; Unique double headed palm wine cup with detailed carving. Custom base included. 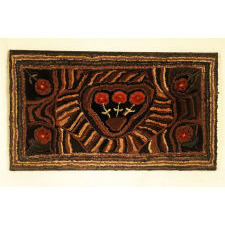 Hooked Rug of the Schooner Bluenose; An early 20th C. hooked rug of Bluenose, a famous fishing schooner from Nova Scotia. 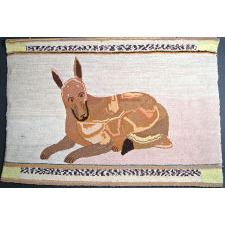 This rug pattern was made by the Garrett family of Pictou County, Nova Scotia and was cal.. Paint Decorated Fireboard With Stone House and Trees; Pine in untouched, dry original condition. Six fireboards by the same hand are known: three from the Babcock Collection, used on a Long Island estate called Harkaway. Another ..
Carved Yellowlegs Shorebird Decoy; Excellent original condition with a mellow patina. Original bill. A faint age shrinkage hairline neck crack has been stabilized. This exact decoy is pictured in Jim Cullen's b..
Railroad Station, Gardiner ME by George E. Morgan; A small gem by Morgan exhibiting his map-like surveyance of the Gardiner Railroad Depot as observed from Randolph. Painted by Morgan aged 91 years, 10 months at the Denico Res..
Emile Branchard (New York, 1881-1938); Moody landscape with inventive composition—denuded trees in the immediate foreground and an ascending tree line in the middle ground. 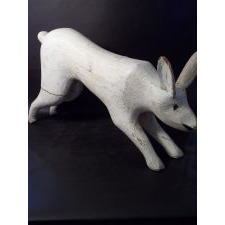 Branchard was a truck driver in NYC..
Carved Wood Rabbit; Folk art carved wood figure of a rabbit, charming profile painted white Louisiana Early 20th century. REMARKABLE Folk Art Still Life Featuring an Export Bowl and Engraved Silver Spoon; Northeast America, likely New York State, possibly New York City, ca. 1840. Oil on canvas. Full of energy and freshness and vigor, this beautiful painting has unusually strong..
Rocking Head Black Duck Decoy With Open Mouth; Superb example in untouched original condition. Original paint is essentially mint. In-the-making patch still covered with original paint on the left side. See Engers' Great B..
Plank on Frame Rowboat Model; Mahogany in pristine original condition. Original white and green exterior paint, and nicely crazed (original) varnish on the interior. Finish work is exceptional. FREE shippi.. 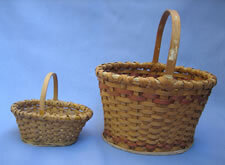 Pair of Baskets from Oley Valley Berks Co. Pa.; Oak splint and wood. This weaver obviously took pride in his work and was capable of making baskets that would bear the weight of use and time. 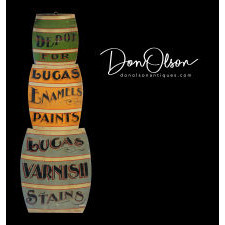 This set of baskets was made by.. 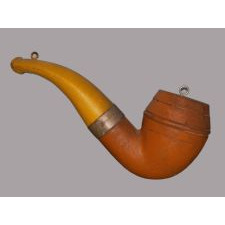 Early Mason Premier Mallard Drake Decoy; Hollow with snakey head in strong original paint. Small professional tail chip repair and neck has been reset. Ding in top of back, still covered with original paint. 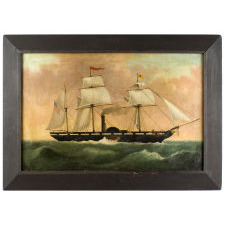 See "Mas..
Sandpaper Painting of the Battle of Vera Cruz; A fabulous and rare mid 19th C. sandpaper painting of the Mexican War, taken from an 1847 lithograph by Nathaniel Currier titled Naval Bombardment of Vera Cruz. March 18..